The Disc Jockey or best abridged as DJ is no doubt quite a popular entity in the current world of music and entertainment and yet, we Sri Lankans have been incognizant with the fact that the art of DJing has been ever-present in Sri Lanka for over 40 years. DJ’s in Sri Lanka have been in action since the early 70’s and this form of entertainment has moved along through astronomical changes with the incorporation of tech and user-friendly equipment. Today, DJing in Sri Lanka has become a common activity on the sidelines of musical events, parties, wedding functions and the likes. The reason ‘DJ Academy’ decided to come up with the subject of DJ formats in Sri Lanka was to mainly provide young DJs with the edifice of the important facet of the DJ and the arts that go into it. And of course without forgetting that even DJ’s need somewhere to start. The DJ Academy in Maharagama is definitely a good place to go about doing just this. Sri Lanka’s very first DJ education and entertainment industry training facility was founded in 2008 by veteran DJ and entertainment guru Tareeq Musafer. The academy was set up to offer quality training programmes in the areas of Disc Jockey (DJ), music production and industry specific soft skills training. ‘Many young people may see the work of a DJ as a prospective business and it sure would be if you apply the right business tools and formats to it. There is a market for DJs out there and one that is not saturated. The vast number of changes that we are already witnessing in Sri Lanka’s music sphere is monumental. 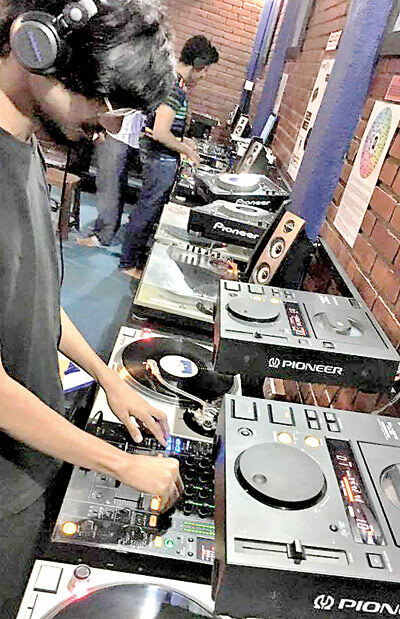 Music festivals are gathering momentum, parties in beaches are as common as ever and the demand for talented DJ’s is growing,’ said Thanujika Perera, the man behind this project. Youth can easily utilize a PC based controller or purchase DJ consoles and practice over these and officiate themselves with the ‘Expert DJ’ tag pretty much overnight. But, no matter how common of an art it might seem to be out there, as Thanujika puts it, there is more to DJing than meets the eye, or the ear. The DJ Academy was initially founded in 2008 by Tareeq Musafer and is currently being managed by Thanujika Perera. Giving us his insight into what makes the DJ Academy so special, Thanujika disclosed, ‘Our aim has been to continually focus on the aspect of turning DJ enthusiasts into professional DJ’s with the correct know-how in the business of DJing. Thanujika divulges that so far, the Academy has churned out a combination of over 1000 DJ’s since the institute came into being and the place attracts keen numbers from regional countries such as India, the Maldives, Bangladesh and Dubai for instance. Training and practice are essential if one wants to become good at what they want to do so. From total beginners to professionals who prefer to brush up on their skills, students can drop by during free days and practice on the expanse of turntables and other serious looking equipment that is available at the Academy. The institute is the only academy currently in Sri Lanka that teaches students from scratch, on how to turn a table or otherwise known as turntablism (not the sort you have at home, really), mix tracks, scratch, perfect their skills as well as learn the basics of mixing business attributes to the work that the DJs would eventually have coming their way.